Sleek non-smoking rooms with free Wi-Fi in the heart of Brooklyn's hip Fort Greene neighborhood make Hotel Indigo Brooklyn a tempting choice for travelers who want to be close to Manhattan. The 128 non-smoking rooms of the high-rise Hotel Indigo promise thoughtful interiors that favor comfort and style above all else. Rooms offer city views of Brooklyn. All rooms feature free Wi-fi cable TV white bedding and walls unique artwork spa-style bathrooms and reclaimed wooden flooring. Enjoy breakfast or dinner at the on-site Brooklyn Cafe or indulge in room service. Stay in touch with the office at the hotel's business center. The hotel offers an on-site fitness center as well as access to an off-site exercise facility for a fee. Pets are allowed for an additional fee. Valet parking is available. Across the street from the subway station in Fort Greene Brooklyn Hotel Indigo is in the center of this vibrant culinary and artistic community. 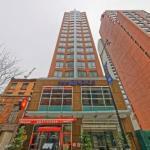 The hotel is three blocks from Long Island University and six blocks from Fort Greene Park. Brooklyn Flea is less than a mile from this hotel. The property is five blocks from the excellent restaurants and parks of Brooklyn Heights. John F. Kennedy International Airport is 19 miles from the hotel.